For the month of June, I’ve put the 13 products I’m using for my summer skin care routine this summer on sale at 25% off. I thought you’d like to have my step-by-step routine since so many of you are using my summer skin care routine. Step 1: I’m not a creature of habit, so I may cleanse my skin with the Rhassoul Cleansing Bar, the Microfiber Cleansing Cloth, or just swipe my skin with Exfoliate. If I use the Rhassoul Cleansing Bar or the Microfiber Cleansing Cloth, I follow with Exfoliate. Step 2: I apply NCN Eye Fix to my entire orbital eye area. Step 3: I apply Vitamin C+ Serum to my entire face including under my chin line. Wait at least two minutes. Step 4: I apply Phyto-Biotics Blueberry & Oat Skin Quench. Wait at least two minutes. Step 5: I apply I’m Covered Physical Sunscreen SPF32. Wait five minutes. Note: I recently wrote about my night time routine and how I make it a ritual. I take my time! The steps below are written with different wait times that are correct if you don’t want to take as long as I do. Results are the same. You can see that article by clicking here. Step 1: Again, I switch cleansers depending on my mood basically. 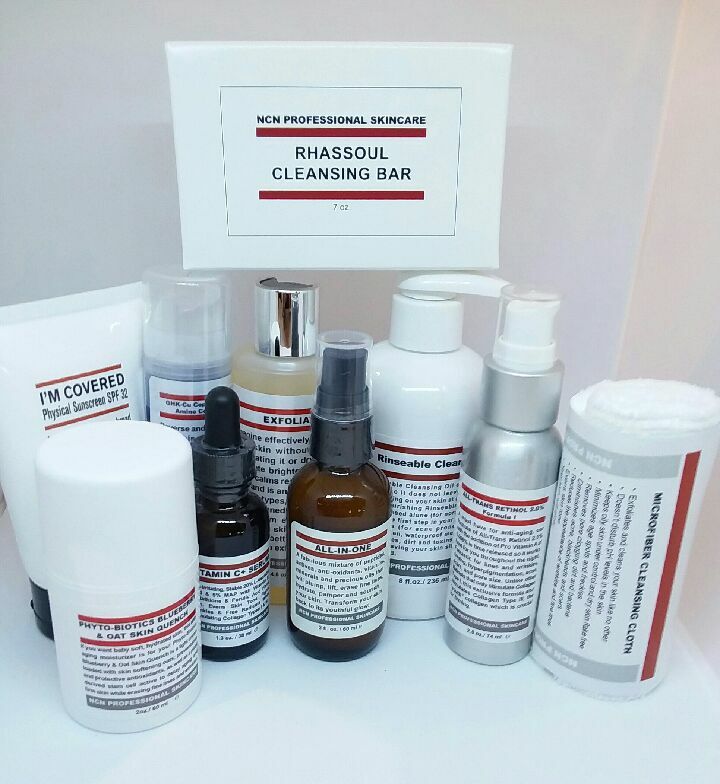 I cleanse with he Rhassoul Cleansing Bar, Multi-Acid Cleansing Gel or Rinseable Cleansing Oil. All of them remove makeup and sunscreen very well. The Rinseable Cleansing Oil is the best one at removing the 24 hour stay put lipstick I wear. Step 2: I swipe my skin with Exfoliate. Step 3: I apply NCN Eye Fix to my entire orbital eye area. Step 4: Three to four times a week, I apply GHK-Cu Copper Peptide Amino Complex Formula II. I massage about 1/2 of a pump and spread it over my entire face (avoiding the orbital eye are) and down to my neck. It takes a very small amount as the spreadability of it is incredible. On the other nights that I’m not using GHK-Cu, I’ve been using my Multi-Active Peptide Matrixyl Serum 25%. I massage it into my skin, including my entire eye area. Wait at least two minutes. Step 5: I massage All-Trans Retinol 2.0% Formula I into my skin. I include my entire eye area, as well as my neck. Wait at least 2 minutes. Step 6: I massage my All-In-One Anti-Aging Cream into my skin, including my eye area and neck. Do you remove your makeup before bed?